Our granola breakfast blend is too tasty to be reserved for just one purpose. Once you experience the flavorful mixture of oats, buttery tasting crunchy almonds, exotic coconut and tart dried cherries that have been enhanced by the addition of aromatic vanilla, tantalizing cinnamon and a hint of salt, you'll look for occasions throughout the day to enjoy this granola. Oats, Dark Brown Sugar, Sliced Almonds, Coconut, Dried Cherries (Dried Cherries, Sugar, Sunflower Oil), Vanilla Flavor (Propylene Glycol, Water, N&A Flavor, Caramel Color, Glycerine), Cinnamon, Salt. Cranberry (Cranberries, Sugar, Citric Acid, Sunflower Oil), Raisins. Great flavor but needs to have more crunch. Still good breakfast. 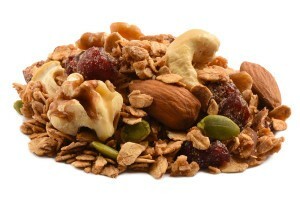 Great granola, lots of dried fruit and nuts. So far we have eaten three twenty pound boxes. This is a great pick me up if you aren’t much of a breakfast person but you need something that morning hunger. I’ve mixed it with yogurt and going to try it with oatmeal soon. 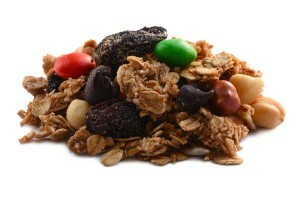 Although this is a breakfast Granola the taste is great anytime of day. All the granolas are priced great.